The Lord called Mike and his wife Glenda from El Paso to the Dallas area in 2003. As they prepared to move to Dallas, Mike wondered if God was calling him here to plant a church, and he decided to pray, seek and wait on the Lord. 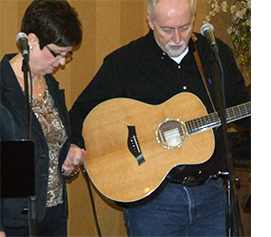 They bought a home in Sachse and attended church at Calvary Chapel of Garland where he led worship for 4 years. In the summer of 2008 he began to have an unrelenting urge to teach God’s Word and he knew God was calling him. He asked his Pastor, John, to pray with him about where God might be leading him to plant. They prayed and the Lord revealed the same message that Forney was where he was to plant. In the spring of 2009 Mike and Glenda sold their house in Sachse and moved to Forney where they began a home bible study on Sunday mornings and Wednesday evenings, and so began their venture in faith. The rest of the story is still being written! Won’t you join them on this grand adventure! Maranatha!